and informative content, and everything in between, the job of an SEO is endless. However, many people overlook an extremely important element of SEO that if ignored could end up rendering a lot of your hard work fruitless. Proper site architecture can make the difference between a first page and second page ranking. In this article I will go over what you need to know in order to properly build your website for SEO purposes. A well thought out site hierarchy is crucial to your SEO efforts. Starting with your home page, and working your way to all the internal pages, you want to make sure that the flow of navigation makes sense and is easy to follow. This is crucial for SEO for three main reasons. a. If your visitors cannot easily navigate through your site and find what they are looking for then your bounce rate will be high and the average time people spend on your site will be low. Those are two indicators to the search engines that your site does not have relevant information and they will rank you lower because of it. b. Link Juice! Properly laying out your site will ensure that you have a free flow of link juice leading from your main categories to your deeper internal pages. Page Rank is still an important factor in how your pages are ranked. You want to make sure every page on your site receives the benefit from other pages that have a high Page Rank. c. Search engine bots navigate through your site just like a human would. They follow links on your site to find pages to index. If the search engine bots cannot find all your pages easily, or run into a dead end, they will leave your site. This may mean that well written, quality pages you spent time creating may not be found and indexed in a timely fashion. Can you force a crawl through webmaster tools to find those neglected pages? Sure. But, building your site properly in the first place will save you the time and has other benefits that we have already discussed above. How Do You Layout Your Site the Right Way? It is actually quite simple. Let’s take a look at the steps you should follow. The “Home” page button is there, so people can easily navigate their way back to your main page. An “About Us” page is a way to tell your potential customers a little about yourself and your business. People like to feel comfortable with whom they are doing business and telling them a little bit about you can go a long way. The “Contact Us” page is an easy way for people to find out how they can talk to you if they have any questions or want to purchase your products or services. The next thing you need to do is decide if you are going to have a blog. I would suggest doing so. A blog is a great way to constantly add new content to your site, which the search engines love, and engage your visitors and potential customers with information regarding your specific business or about your industry in general. You can also go the humor route and post funny and interesting tidbits about you, your business or even just about random things. People love to laugh and making them laugh is a good way to get them in the buying mood and make them feel comfortable about doing business with you. If you do decide to have a blog, then you must be able to make the commitment to it and post at least a couple times a month. If you take too long in between posts, then it makes it seem like you don’t care about your website and that can reflect badly on your business. The truth is you are probably too busy running your business to be able consistently post to your blog, but your potential customers don’t know that. To some of them it could seem like you are lazy, just don’t care or even possibly that you’re no longer in business. If you have decided that you can make the commitment to regular blogging then you can place a button for it in the main navigation. We now have four buttons in our main navigation. The next thing you have to do is decide what you want your main category pages to be. The answer to this question will differ depending on what type of business you run. For example, if you are a Family Law lawyer then you are going to have a button in your main navigation called “Family Law.” You would want to name it that because you want to take advantage of keywords in your navigation. 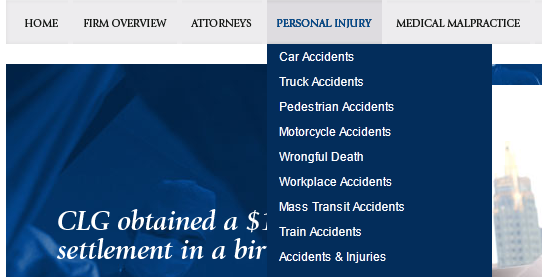 Now, if you are a Personal Injury Lawyer that also handles Worker Compensation, Social Security Disability claims, Medical Malpractice and Maritime Law then you may want to consider creating a main “Practice Areas” overview page and utilizing drop down navigation to list each of your practice areas. I recommend this approach if you notice your navigation getting too crowded. You don’t want to have nine or ten buttons in your navigation. It just doesn’t look atheistically pleasing and it can force you to make the buttons, and by consequence the text on them, so small that they become harder to read. I would suggest limiting your navigation to 7-8 buttons if you can. After taking into account your Home, About Us, Contact, and Blog buttons, that leaves you with space for an additional 3-4 buttons. If you are selling products and have more than 3 or 4 of them, then you may want to consider creating a main “Products” page and either linking your products solely from that page or utilizing drop down navigation in addition to linking. Now that you have your main navigation figured out, it’s time to move onto the next step. If you have decided that you need to employ drop down navigation, as most sites do, then you need to properly structure it. This is sometimes referred to as “siloing” or using a “silo” technique. Let’s go back to my lawyer example. a. 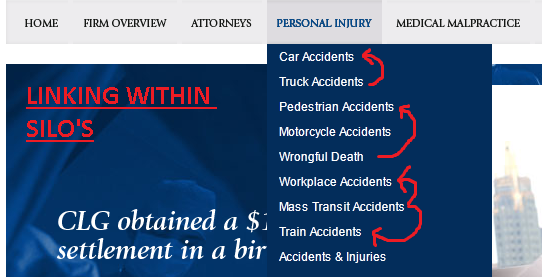 You practice three different areas of law, Personal Injury, Medical Malpractice and Social Security Disability, and you have put them in your main navigation. 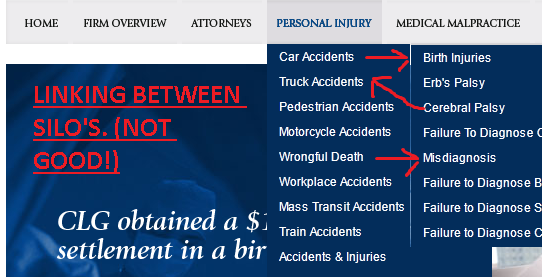 Underneath each one you are going to have a drop down menu with links to pages talking about specific types of cases. You would then do the same for the other two areas of practice (Medical Malpractice and Social Security Disability). b. 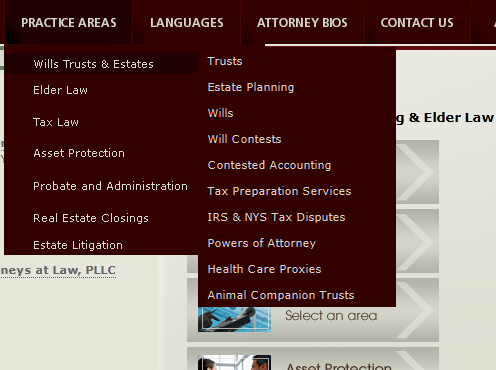 You are a lawyer who practices more than three areas of law and you decide that you need to create a main “Practice Areas” page and have a drop menu link to each individual area of practice. You want to keep your navigation limited to three tiers. Tier one is your main navigation. Tier two is your first drop down menu and tier three is the drop down menu linking off of your first drop down menu. a. Ease of use. Visitors can find four and five drop down menus confusing and annoying. b. Search Engines. You want to keep all your main content and important pages within three clicks so the search engine bots don’t have to look long to find the important information. In our example the first click is your main navigation, the second click is the main practice area pages, and the third click is the specific case pages. Now that we have taken care of our navigation the next step is to start internally linking. When you internally link your site’s pages you want to make sure that you do so in a hierarchical structure. This means that you typically want to link top down from your home page to your internal pages and not bottom up to your home page. Although, in some cases where you have an internal page with a higher Page Rank than your home page, you may consider linking to your home page from it. However, for the majority of websites, the page that is linked to most often, and therefore will probably have the highest Page Rank, is going to be the home page. You want to link this way so your link structure is created in such a way that allows for the most optimal flow of link juice through your site. Using our lawyer example, you may have anchor text links (links that incorporate keywords not “click here”) that link from your home page to your main practice area pages. On your practice area pages you would link to your specific case pages. However, you would most likely not link to your home page from any other page on your site (refer to my exception above). Also, when you are using a “silo technique” for your navigation, you never want to link between silos. Linking within silos is permissible, but linking between them is inadvisable. You also want to keep the number of links on each page to a minimum. There is no real set number to abide by, but common sense should tell you that when there is an inordinate number of links on a page compared to the amount of written text then you probably have too many links. These links should be tagged with “no follow” so you aren’t sending these pages any link juice. Following these simple steps will help you to create a site that is search engine friendly and easy for your visitors to navigate. Joseph Piracci is an internet marketing expert with 7 years of experience in SEO, SEM, Social Media Marketing and e-Commerce Management. Contact his internet marketing company, Predominant Domains, for more information.